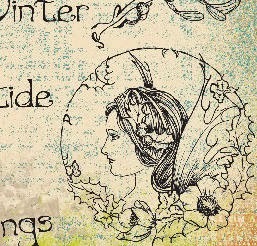 Hi there everyone , Liz Borer here with a sneaky peak at my new stamps that PaperArtsy have made . My idea was to design stamps that could be used for Christmas but could also be used for winter projects . 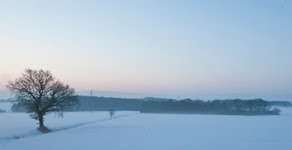 See what you think . This plaque was made of heavy card but could also be wood . I spread Grunge Paste through a stencil to create some background texture and when dry I painted the whole piece with Antarctic Fresco Finish Paint . Once that was dry I blended Bora Bora , South Pacific and Space Cadet all over the background with wet wipes . I added a little Hey Pesto here and there to tone in with the colours on the baubles . When all the paint was dry I rubbed a little White Fire Treasure Gold onto the raised areas . Using one of my new leaf stamps, I stamped and embossed with gold embossing powder at the top and bottom of the plaque . 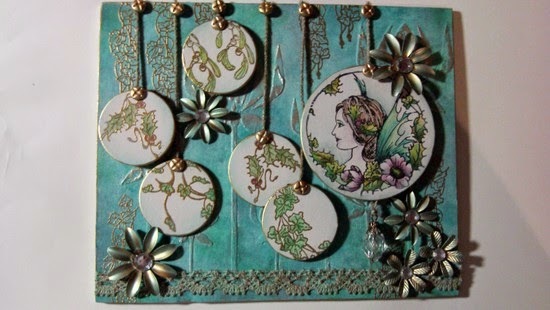 To create the baubles I took several circles of card and painted them with Nougat . 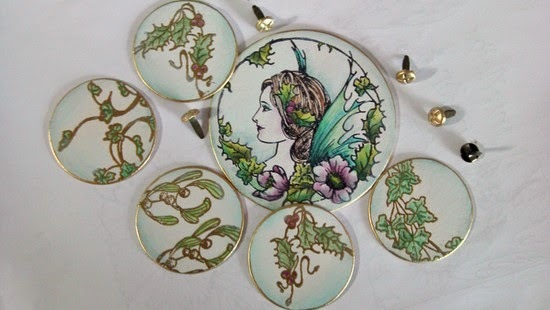 I stamped and embossed with gold various leaves on the smaller circles and also stamped with black archival ink a face of one of the fairies onto a larger circle .I coloured these using various fresco paints mixed with matt glaze to make them more transparent ( the lovely pink colour is Plum from the new Ltd. Edition Eclectic 02 ) .Finally I used gold paint to colour some metal flowers and brads and rubbed some Aquamarine treasure gold onto the flowers . Everything was attached to the plaque using silicone glue ( or similar ) so that the baubles could be raised at different heights from the background . I thought that decorating a plain gift bag to be used for winter presents would be fun and so here it is .Cut two pieces of smoothy card to fit the bag as shown ( I covered the front and back to match ) and paint with Dolly Mix . When the paint is dry stamp my new icy stamp randomly around the edge bearing in mind the placement of the decoration . 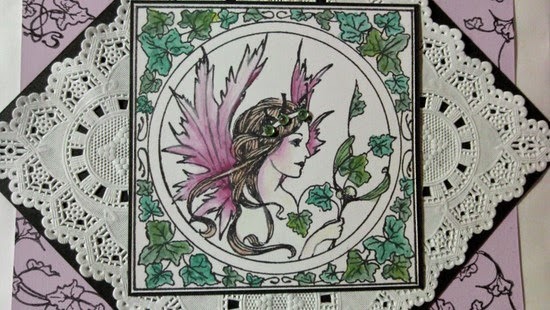 On a piece of smoothy card stamp a face three times and also use the word stamps to create Winter Fairy and stamp this twice .I coloured the fairy stamp with fresco finish colours mixed with matt glaze . The wings are Dolly Mix and Plum , the face is Nougat and the leaves are Hey Pesto and Evergreen .For the tag I cut out the central design and coloured it the same way. I then layered the doily , the face design and the words onto black card and stuck them to the bag as shown . I only added a tag and various sparkly bits to the front of the bag . 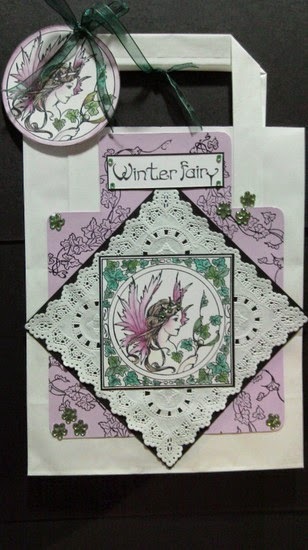 This bag could be made in lots of different colours because the background and the fairy's wings coordinate . 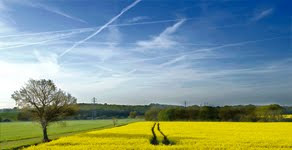 I hope that you have enjoyed this little peak at the new stamps and I will be back soon . A huge thanks to Liz, and congratulations from all at PaperArtsy HQ on your new stamps. These are so different from anything else that we have and we look forward to seeing how everyone uses them. These are both so pretty but my favourite is the plaque. The new colours are going to be so tempting as well as the new stamps. Pretty projects and beautiful new stamps! I can't wait to see the rest of your new release! Beautiful stamps and the plaque is stunning!